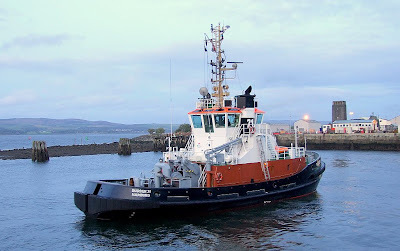 A German tug belonging to the long-established Bugsier company reached the Clyde on Sunday afternoon. BUGSIER 21 anchored at the north end of Cumbrae, and is presumably involved with the repairs to the pipe-layer SOLITAIRE. This afternoon, with freshening weather and a northwesterly wind building up, BUGSIER 21 left her anchorage and headed up the firth to seek shelter in the James Watt Dock along with CARRON. In the first view BUGSIER 21 is seen heading past BOA FORTUNE, one of the support ships currently on charter to Allseas, owners of SOLITAIRE. She is seen in this second view as she approached the entrance to the James Watt Dock. BUGSIER 21 was built in 2000 by Hitzler Werft at Lauenburg on the River Elbe, east of Hamburg, and is one of three sisters. Powered by two Voith Schneider propellers, she has a bollard pull of 50 tonnes, and overall length of 30.62 metres, and is 382 gross tons.